There is a strong and growing trend of interest in the Japanese countryside among foreign travelers. The problem is that good information for travel planning is scarce. Here we build a resource for anyone interested in traveling off the beaten track in Japan. 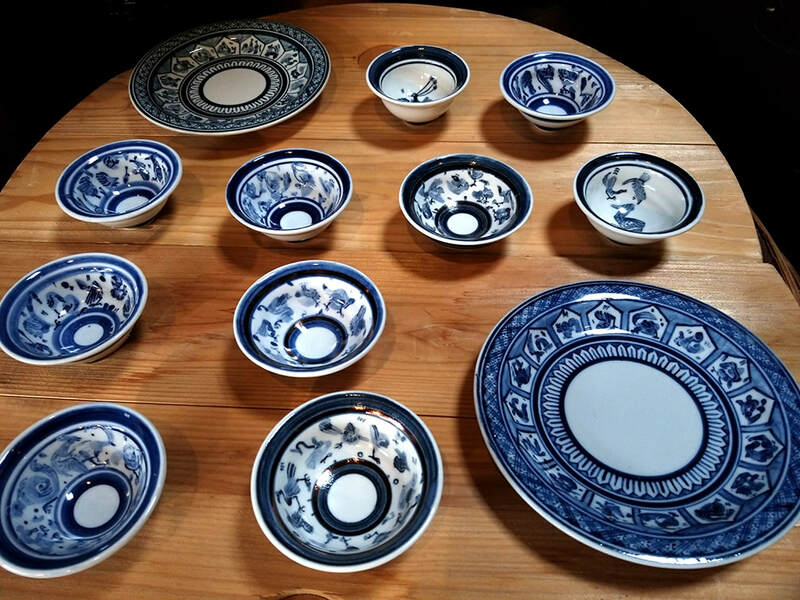 Tajimi, the focus of this site, offers some of Japan's best pottery, as well as great local food, with a rich taste that suits many Westerners. The city is located near Nagoya, and an excellent starting point for further exploration of Gifu, with it's castles, excellent sake (preferably drunk in Mino ware cups from Tajimi), the largest number of festivals in any region in Japan, and charming small towns at just the right size for you who like to explore by foot far away from the crowds in Japan's tourist traps. Since I arrived in Japan 30 years ago I have always enjoyed the cherry blossoms viewing each spring, but over the years I started to long for a place where you can escape the crowds and just enjoy a peaceful day and a picnic under a tree. Shiominomori is a mountain park in Kasahara, Tajimi city is the perfect spot for this. The vast grounds of this park has a barbeque spot and the mountain park is an apt location for picnicking and playing. There is an observation deck situated at the top of the mountain from where you can see Tajimi, Toki as well as Nagoya cities through the telescopes. Take a cab from the station and bring food and drink. The park is open until 5 pm everyday. This video clip was shot during our drive back down from the mountain. There will be a nice selection of 360 VR photography from the park available here shortly. If you have ever visited the big tourists traps in Japan you are aware that the crowds can be overwhelming, both for the visitors and those who trade to them in the tourism economy. But where to find a unique experience and a warm welcome? Try Suwa town! The place looks like something taken out of the hobbit world, sitting in a beautiful valley up in the mountains. Hundreds of years ago, people fled war to settle down in this remote place, which even many living in Tajimi city have never visited. Every year they have a summer festival where you can eat and drink as much as you like and enjoy dancing in the night. 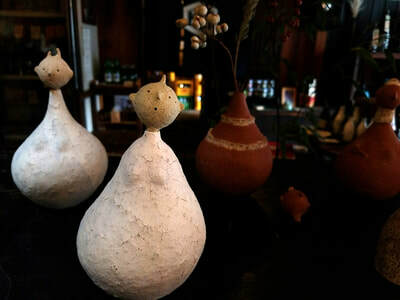 the tajimi AUTUMN Pottery festival - Held yearly on October 7, 8, 9. The constantly happy and friendly owner of Tamaki Liquour shop. 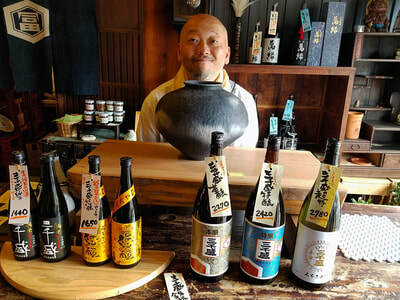 Plates and sake cups on display in the Tamaki Liquour Store. Price: 2,500 yen (US $22) for the cups. 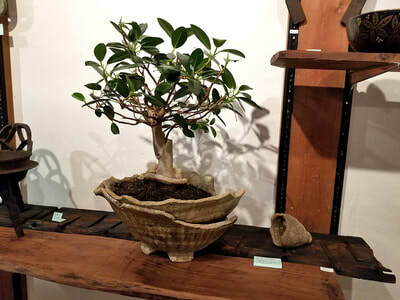 Bonsai pot. The pot is a piece of discarded pottery dating back several hundred years. Price: 18,000 yen (US $ 160). 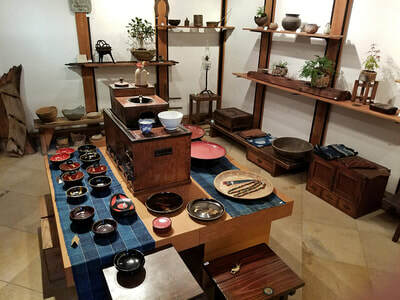 Showroom displaying various pottery, an old brazier in the centre, and bonsai pots. This short video shows me and and the owner of Tamaki's Liquour Shop talking about the pottery on display during the Tajimi Autumn Ceramics Festival. 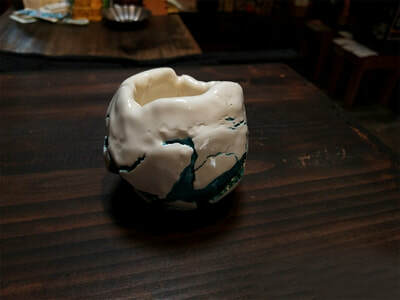 We start with a large and finish with the sake cups. It's a very cosy shop, where you can also enjoy jazz events. Subtitles will be added shortly. In this video of the Tajimi Festival parade 2017 I appear as Saito Dosan, a monk and warrior, feared for his ruthless power game :-) In the end of the clip you will see a man enacting the pottery aesthetics obsessed war lord Furuta Oribe, whom I wrote about here. But first you'll see Tile man. He is a classic manga hero and now stands as a statue outside Tajimi Station. After all, tile making is a big industry here... If you plan to travel to Gifu in November, this is a good day to visit Tajimi.